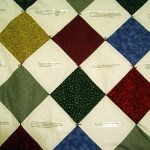 Quilts are made for the community raffles, charity, and for personal use. We have given quilts to the Mosier School and the Seniors to raise money for their use. Also have given them to the Mosier Food Baskets at Christmas. We are hoping to get baby quilts done to give to the Hood River Hospital.